When I go to most of the political events that feature on My London Diary I’m going as a photographer rather than to take part in them. If you read what I write it is of course usually fairly clear whether I support them, or what reservations and disagreements I have. 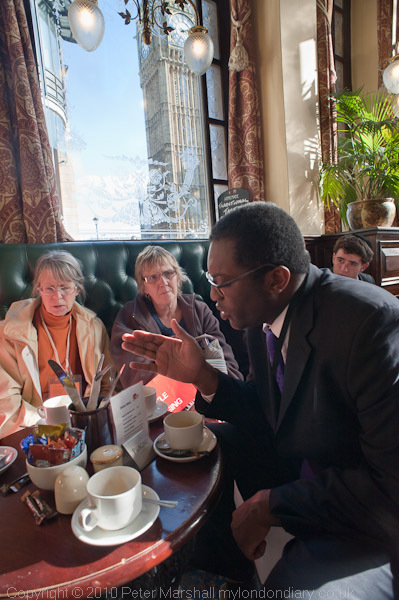 But last Wednesday morning it was a little different, as I was actually going to lobby my MP about action over trade justice in an event organised by Christian Aid. For many years my wife has organised local events for this charity, including the annual house to house collection carried out by members of local churches. It’s a charity that I admire for its work with local groups of all kinds (certainly not all church connected) in the majority world, really tackling problems at the most basic level through working with cooperatives and other small organisations, as well as its relief work in disasters, where its local connections can enable it to be far more effective than some other aid organisations. So rather than attending as ‘press’ and going up into the gallery, I went into the hall along with the crowds and was seated by a steward in the centre of the hall rather towards the back. I hadn’t actually intended to take photographs during the meeting, just to listen to the speeches, and I settled down in my seat, waiting for the event to begin. But then I thought I had a decent view of the front of the stage and although the hall was fairly dim there was some spotlighting there, and I took out the D700 and fitted my Sigma 55-200 lens. It wasn’t ideal – at 200mm the maximum aperture was f5.6 and really I could have done with another couple of stops. Exposures varied from around 1/50th to 1/250th working at ISO2000, and even at the slower speed some were sharp. Unlike most lenses I now use, this one doesn’t have image stabilisation, which might have helped, although some of the wasted frames were caused by the subject moving. I stayed sitting in my seat to increase stability and also because I didn’t want to cause more annoyance to those seated around me. I also hoped that the tops of heads in some pictures would give a greater feeling of actually being there. Jesse Jackson, the star of the show, spoke without gestures, just occasionally glancing up from the text he was reading with a penetrating glance over his glasses direct at the audience and in particular me in the middle of it – which I caught on several frames, including the one above. The message was in his words and not in his performance. Others, and Jackson himself when not speaking, as you can see in the pictures on My London Diary, were at times more demonstrative. But as a set of pictures these are of course limited by the same viewpoint throughout, though there are some changes in framing. 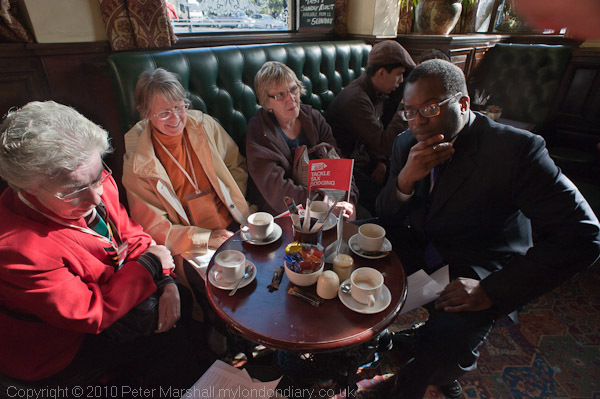 Later, when actually lobbying my MP – we had coffee with him in a pub – I had more freedom, although I was also trying to take part in the discussion and really you can’t do two things at once. These pictures were taken with the 20mm f2.8 and the main problem was excessive contrast, with direct sunlight streaking in on one of those taking part and the dark skin of our MP in deep shade. It was a situation I would have written off when working with film, even with colour neg – and perhaps used for graphic effect in black and white. But with a lot of work in Lightroom I managed to get usable results. 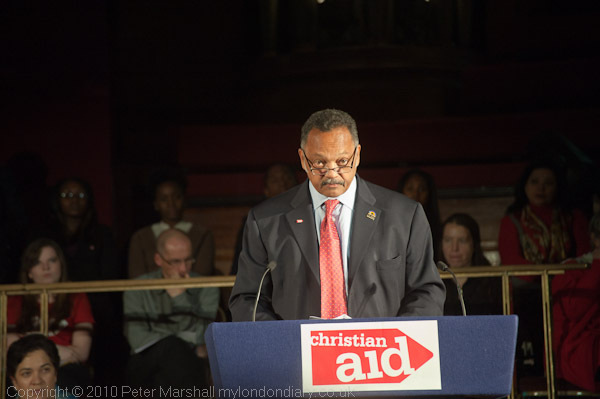 I also had to give extra exposure to the Christian Aid logo and the blue background of the lectern, which was excessively prominent in the pictures, and was I think lit rather more strongly than the speakers. Of course, using flash fill would have simplified things, but it would also have altered the whole atmosphere of our meeting, which I didn’t want to do. As we left of course I did take a few more boring shots outside to send to the local newspaper, who tend not to like any more interesting pictures. 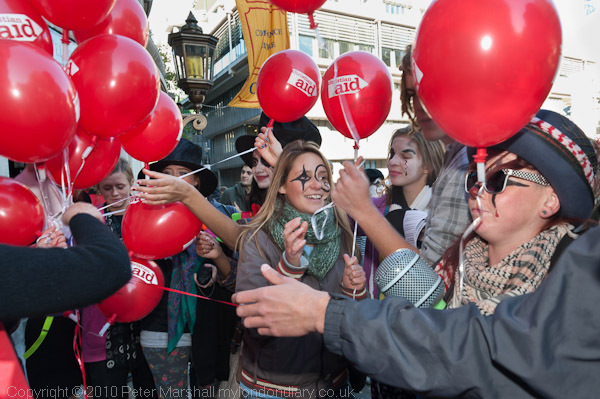 Finally I photographed some of the younger Christian Aid supporters who were parading around the Westminster area. More on My London Diary. This entry was posted on Monday, October 25th, 2010 at 10:16 am and is filed under My Own Work, Photo Issues, Political Issues. You can follow any responses to this entry through the RSS 2.0 feed. You can leave a response, or trackback from your own site.